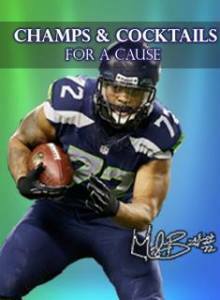 Join Super Bowl Champ Michael Bennett and fellow Seahawks Doug Baldwin, Brandon Mebane, Jesse Williams, KJ Wright, O'Brien Schofield, Percy Harvin, Kam Chancellor, Bruce Irvin, Jordan Hill and Malcolm Smith for a day of cocktails, appetizers, and a meet & greet with the athletes to benefit his charity, OCEAN! Arrive at 1 PM to step out on the green carpet for photos with Seven of Hearts Photography to commemorate meeting the Legion of Boom! Dine on delectable Tailg...ate-Style hors d'oeuvres from Chef Tyler of the Columbia Tower Club and enjoy beverages from Vita Coco, Dry Soda, Beam Global, Silver City Brewery and Ninkasi Brewing. Partake in Seahawk-inspired cocktails, one drink per ticket sponsored by Columbia Tower Club, as Michael Bennett and teammates sign two items for each guest. Tag live photos on the 103-Inch TV screen using hashtag #bennett72, provided by Tagboard. During the signing, we'll have a silent auction with great items from BEAM Global, a Sounders signed Jersey donated by David Estrada, a dine-around-Seattle Restaurant package, Uber gift card, a Nordstrom gift basket, Adventura package for 4, Ninkasi & Silver City Gift Baskets, Michael Bennett Donated Seahawk/Broncos game tickets and more! •Cupcakes provided by Yellow Leaf Cupcake Co. Please abide by Columbia Tower Club's dress code: smart casual. Nice denim is allowed, but no hats, shorts or running shoes please. Seahawks shirts and jerseys are encouraged! A very big thank you to our sponsors: Seven of Hearts Photography, Vita Coco, Dry Soda, F.A.S.T, Kind Bars, Pop Chips, Pop! Gourmet, Silver City Brewery, Ninkasi Brewing, #Tagboard, David Estrada of the Sounders, Yelp, Uber, BEAM Global, Yellow Leaf Cupcake Co., EyeKandy Studios, Chocmo and Sean Grant Make-Up Seattle, Socially Savvy, DJ V, and Columbia Tower Club.